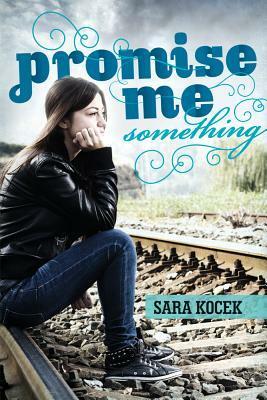 Book Review: Promise Me Something by Sara Kocek - Book.Blog.Bake. I’ve been having a run of bad book luck lately, so I wasn’t exactly expecting Promise Me Something to blow me out of the water. In fact, as I began this book I felt very “ugh” about the idea of reading it, but I knew it wasn’t fair to dump my experience from my past few books onto an innocent one, so I tried to be as open-minded about it as possible. And against quite a few odds, Promise Me Something ended up being quite a good book. Let me first start with the few things I didn’t like about this book. There’s an elaborate scheme at the end of this book that reminds me of Angie’s scheme in The S-Word, which I really didn’t like. I don’t know why there seems to be this idea in contemporary YA that the only way to bring the attention of something heinous to the authorities in charge is by an elaborate scheme that takes 2-5 committed people, a lot of paper, and perhaps even committing your OWN felony. Perhaps readers find this exciting? Maybe it’s just me. The only other thing I found a bit disappointing was the beginning– the first couple of pages were a bit awkward, but by the end of the first chapter I had forgotten all about the first couple of pages. Now on to the positive stuff! Reyna and I have quite a bit in common– we’re both fairly shy, we’re both studious, and we’ve both lost a parent. Even though it was just a subplot, I really liked how Kocek handled Reyna dealing with her dad and his girlfriend, as well as all her conflicted emotions in regards to her parents. It was subtle, but emotionally charged. You could tell how much Reyna really loved her dad, even when her actions might indicate otherwise if Reyna wasn’t the narrator. Promise Me Something deals with some pretty dark issues, but I found it all really well-done. It didn’t spread itself too thin, but instead really concentrated on suicide and bullying. No one in this book is portrayed as being completely innocent, either. Olive is definitely the biggest victim in the book of bullying, but she also makes mistakes, says some pretty mean things, and lashes out at people. No one is completely safe from hurt feelings, and no one is completely innocent, which I appreciated. This book embraces the grey areas of life, and I like that. There’s only a bit of romance in this book, and I actually really liked it. It’s not at all the focus of the story, and after some big things happen(I’m being vague in the intention of no spoilers! ), it pretty much disappears into the background. When the romance is around, it’s subtle, slow, and starts as a friendship. It wouldn’t even be worth bringing up except for the fact that Renya’s love interest, Levi, became my favorite secondary character so I have to discuss him a little bit. He’s supportive, but also encourages Renya to stand up for what she believes in, which she has a hard time doing at first. He’s definitely a secondary character, but an extremely well-written one. Not gonna lie, this book at times, especially in the first half, reminded me of a less-intense take on Mean Girls, but it dealt with issues much more complexly and really came into it’s own in the second half. It’s a great contemporary for when you’re in the mood for a book that deals with real and dark issues. Final Impression: Promise Me Something might not be the most original book, but it handles some pretty common themes much more complexly and realistically than books I’ve read in the past. There’s a lot that happens in this book and that gets dealt with, and it won’t be for everyone. That being said, it was a fantastic read with characters who felt very real to me. 4/5 cupcakes. Right. And I know teenagers might not always want to go to the authorities, but even so, out of all the plots you COULD come up with, the ones that end up in books tend to be quite ridiculous sometimes. And there’s SO much chance of failure. It definitely did deal with some tough issues in a very real way though, which I appreciated.